Can you think of anything more joyful, delicious or satisfying than these three little words? Chocolate chip cookies are far and away the most popular type of cookie here in the U.S.
What's not to love about these sweet and buttery chocolate-studded cookies? We think that the "best" recipe is really a matter of personal taste. And obviously chocolate chip cookies come in all different kinds of styles - big, bite-size, chewy, soft and cakey, crunchy and crispy - just to name a few. It's hard for me to say that I really have one favorite - it sort of depends on what kind of mood I am in. Some times I want just simple chocolate chip cookies with very few ingredients while other times I want them to be more complex with dark and milk chocolate and fancy nuts! Be sure to check out the video at the bottom of the page - it describes how to adjust flour, butter and sugar in your recipe to give you the type of chocolate chip cookies you are looking for: cakey, soft and chewy, thin or crisp. Obviously, nobody will never be satisfied with just one recipe for chocolate chip cookies. Since they come in many different varieties and styles, the only solution is to have lots and lots of favorite recipes to choose from. To please as many different tastes and preferences as possible, we need great and reliable chewy chocolate chip cookie recipes as well as favorite recipes for crispy chocolate chip cookies and soft cookies too. Busy home cooks with limited time want an easy chocolate chip cookie recipe that won't let them down. Nostalgic home bakers want the same recipe for classic chococlate chip cookies that grandma used to make. And of course, we can't leave out all those wonderful combination cookies, like - peanut butter chocolate chip, oatmeal chocolate chip, banana chocolate chip, and pumpkin chocolate chip. When you stop to think about it, the varieties of and ingredients for chocolate chip cookies seem endless. We probably could have just as easily created Best Ever Cookie Collection to only contain chocolate chip cookie recipes, but our love of all flavors and types of cookies, brownies, bars and squares runs too deep. It's hard to think that Ruth Wakefield could have imagined a world full of so many wonderful varieties of chocolate chip cookies all those decades ago when she invented the original - The Toll House Cookie - at her Massachussetts Inn. It's so amazing how many different tastes and textures can be created with basic chocolate chip cookie ingredients. Do you have a favorite chocolate chip cookies recipe you want to share? As we all know, you really can't have too many recipes for chocolate chip cookies! What's more classic than chocolate and peanut butter? Easily adaptable to your favorite flavor of Hershey's Baking Pieces: milk chocolate, semi-sweet, special dark or premier white chocolate. Who doesn't like chocolate with their oatmeal? Easy to make mint chocolate chip cookies with fresh chopped mint and mint chocolate chips! 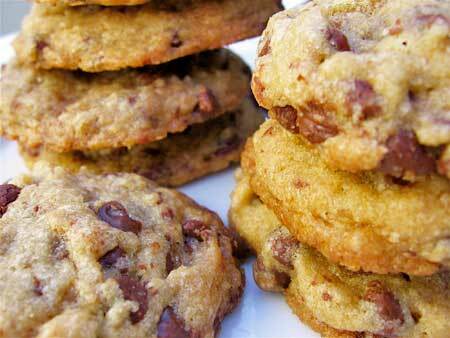 The Best Chocolate Chip Cookies in L.A.
Do Premium Ingredients Improve Chocolate Chip Cookies?